Every institution can benefit from more analytics expertise, but it's often daunting for prospect development experts to expand their skills beyond tried and true methods in Excel. To bridge that gap, this presentation will introduce attendees to the R programming language from the perspective of those who are already comfortable analyzing data in spreadsheets. By learning R, one of the most popular programming languages for performing data science, attendees will be able to maximize the value of their organization's data. Attendees will learn the R equivalents of intermediate Excel skills, including combining separate spreadsheets, summarizing data in pivot tables, and manipulating text. We will also sample some more advanced R topics, such as Web scraping, data visualization, and programming our own functions. So, R you ready? 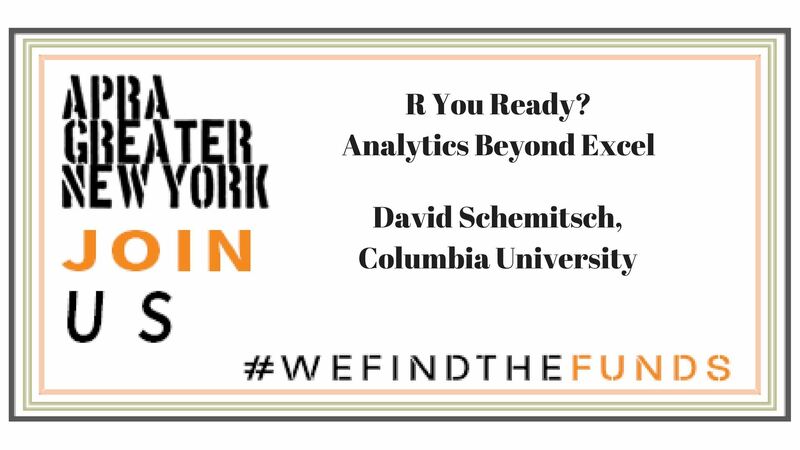 Presented by David Schemitsch, who has been associate director of data science at Columbia University's Office of Alumni and Development since 2017. He joined Columbia's prospect development team as a research analyst in 2013. He began his career in nonprofit fundraising in 2009 as a prospect research intern at the International Rescue Committee, preceding his roles as revenue processing specialist and research analyst. He received a BA in politics and anthropology from NYU and is currently pursuing a degree in data science from Columbia University.